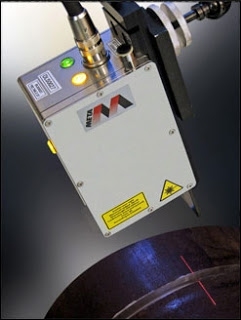 When I joined Meta Vision Systems, the company was going to launch a new 3D digital laser scanner for use in automated welding equipment by following an extensive R&D programme combining optics, electronics, firmware and mechanical sensor design. And I was asked to be in charge of TI DSP firmware and Windows applications development. Digital Laser Scanner so-called DLS300 is a special laser scanner system which is based on the triangulation principle use a scanning laser spot projected onto the target to produce its 3D profile to control a welding machine automatically. As it is based on a scanning spot rather than conventional laser vision systems' laser stripe, it could solve the two main problems of stripe-based triangulation. 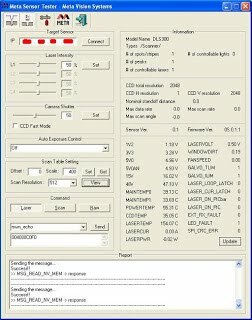 First, as it is easy to implement effective automatic gain control to compensate for reflectivity changes, it can get a perfect image by increasing the light reflected from dark areas and decreasing the light received from lighter areas. Second, as imaging is via a linear charge coupled device that only looks at the region of interest, it is not affected by reflections. Additional benefits of the scanning technology include a programmable field of view and independence of the sensor’s depth of field from the width of field.